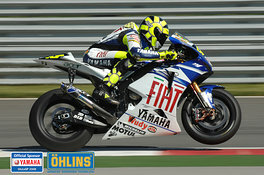 Congratulation: Valentino Rossi tooks his eighth worldchampionship - unbeleavable! After two years the ambitious Yamaha pilot won the titel back. Shootingstar Casey Stoner, 2007 superior champion on his Ducati, tried to avoid Rossi´s success - and became second! Anyway, ÖHLINS could not loose in 2008: Both top pilots trust on parts of the swedish company and gave the certain feedback to the ÖHLINS technicians, that is neccessary to improve parts for the normal customer in a professional way.